Faster. Simpler. More precise, reliable, affordable and productive. 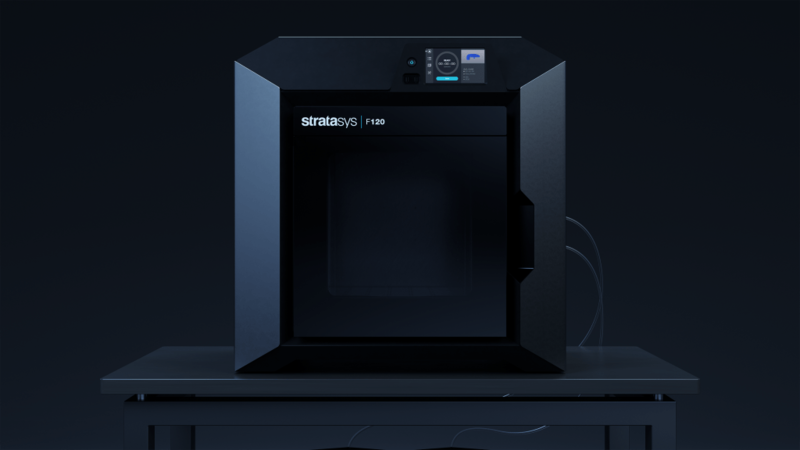 The F120 is the latest desktop 3D printer from Stratasys and, thanks to its advanced capabilities, it provides designers, engineers and educators with the smoothest route yet to industrial-grade 3D printing. Part of the best-selling F123 Series of FDM machines, it was developed with simplicity in mind and is everything that the industry has come to expect from Stratasys in terms of accuracy, durability and low maintenance. The plug-and-print solution – also the quietest machine on the market – is suitable for design studios, offices or classroom environments where users may not be experts in 3D printing. Supported by intuitive design-to-print GrabCAD software and a user-friendly touchscreen interface, anyone can quickly adapt to the technology and begin producing high-quality parts. Equally impressive is the fact that the F120 is proven to work for 250 hours uninterrupted thanks to new, large filament boxes, printing up to three times faster than competing systems and therefore offering an extremely quick return on investment. When workflows are streamlined, the concept iteration and component verification process becomes a much quicker one, leading to increased productivity. What makes the F123 Series so special? SYS Systems has been a Stratasys platinum partner in the UK for more than a decade, supplying and supporting the entire product range. During that time the F123 Series has become hugely popular owing to a combination of powerful FDM technology and GrabCAD software, making for the most versatile, intelligent but cost-effective 3D-printing experience available. Offering up to four different materials with easy-to-remove soluble support matter across the F120, F170, F270 and F370 range, users can print everything from fast, low-cost concept models to durable assemblies, making them a popular choice whatever the budget. Once a business, studio, university or college has discovered the benefits of an in-house 3D printer, they never look back. Office friendly and with no compromise on accuracy, detail and repeatability, the F123 series is the fastest, most dependable and most efficient route to get products to market. The F120 is a more than worthy addition to the series and, during more than 1,000 hours of independent testing, comfortably outperformed its rivals. Its engineering-grade materials delivered top results against a number of key build attributes, including feature reproduction, part sturdiness and surface quality. Clearly, the F120 is yet another 3D-printing industry game-changer from Stratasys.